Currently Loving #4 | emma etc. Happy September! I'm certainly excited for Spring. 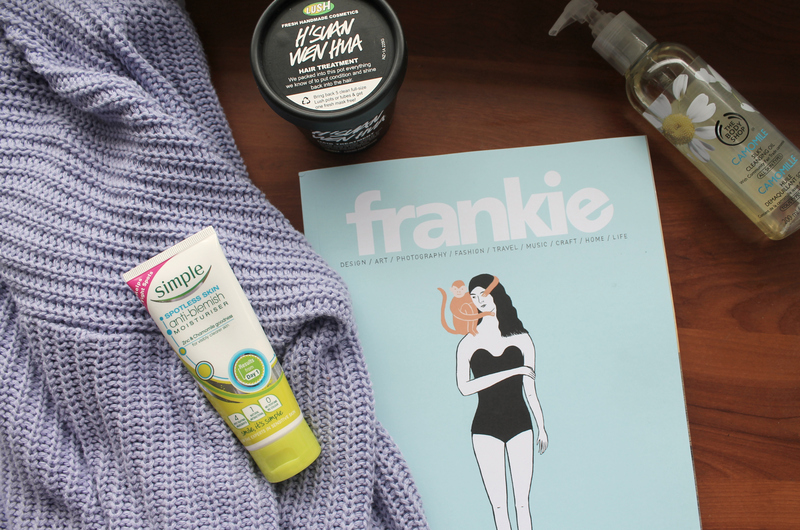 What I've been currently loving consists of a few beauty bits, a gorgeous jumper and a good ol' Frankie issue. My first post ever on this blog consisted of a Frankie Magazine, just know I love them, alright? This one looks particularly good, that blue on the cover is just gorgeous. Now let's talk about this American Apparel Jumper, shall we? I love everything about it - the purple colour, the slouchy comfy fit and the way it just covers my ahem *behind*. I don't think I'll want to wear another jumper for a while - it's actually not too thick so perfect for Spring weather. The beauty bits I've been loving include a hair mask, a cleansing oil and a moisturiser; the perfect things for winter pamper nights if you ask me. As I'm writing this post I'm sitting with a good old lathering of this H'Suan Wen Hua hair treatment on my head. It's great stuff - it's thick and full of loads of things that will definitely improve the quality of your hair and just make it very soft. I think the Marilyn treatment may just out weigh this as it's better suited for my hair type, but I've liked it anyway. The moisturiser I've been using a teensy bit and mixing it with my usual light moisturiser, again from Simple. This is the anti-blemish moisturiser from Simple and I have to say, I actually noticed a difference within a few days with my skin clearing up. Today it's seen better days but my skin likes to throw hissy fits so good skin days come in little stages. The only thing I had changed in my routine was putting this in, so who knows, maybe it's good stuff? I wouldn't use it on it's own though as I find it's too drying by it self. Lastly we have the Body Shop Camomile Cleansing Oil - the Body Shop is seriously stepping up it's game - if I wasn't saving I would be having a shopping spree in there right this instant. This cleansing oil is alike to the Emma Hardie Cleansing Balm which I have as well, and have been trying to use it sparingly over the course of half a year - both are so lovely. Get this if you're on a budget, you won't regret it!